DICE is rolling out a new patch for the PC version of Battlefield 4 that fixes the "top three crash issues" on the platform. 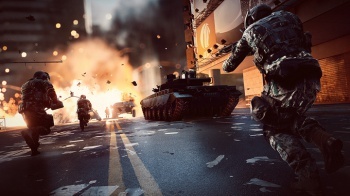 In an update on the Battlelog forums, DICE has announced that a multiplayer patch for Battlefield 4 has started rolling out for the PC version that will fix "three of the top crash issues" and the "revive UI" being permanently shown on a player's screen after accepting a revive. It's a rather small update, and we've included the entire patch list, which you can read below. The update should start automatically once you try to play multiplayer. But if it doesn't, go into your Origin client, right click Battlefield 4 and select "Check for updates" to manually start it. While constantly downloading game patches might be annoying for BF4 players who just want to play, at least DICE has been quick in doling out patches to fix the myriad of technical issues the game has been suffering since it launched, no? In related news, a law firm has filed a class action lawsuit against EA regarding BF4 on the behalf of its shareholders due to the game not working as advertised.